The Weeknd puts a new spin on an old classic, tackling R. Kelly's 1995 hit, "Down Low." Abel debuted his version of the song on the latest episode of OVO Sound Radio, Saturday night (Sept. 9). With a slightly different track than the original, the XO singer takes off on the remixed version laying down his ghostly falsetto. 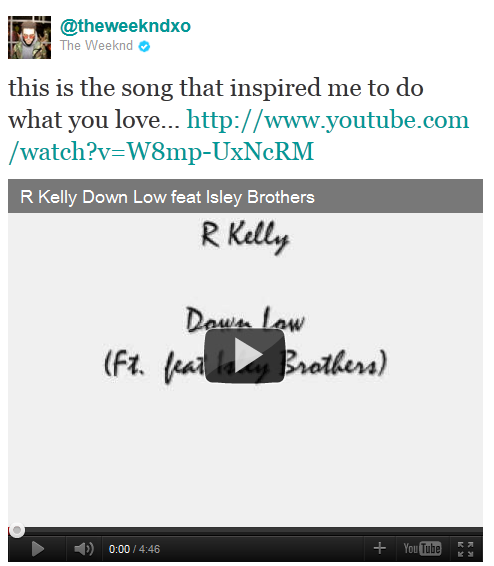 The Weeknd has a huge affinity for the track, and has called it the song that inspired his career. It is unclear what made him finally cover the song now, but his version is pretty dope. In other Weeknd-related news, the singer was recently a no-show at the 2017 MTV Video Music Awards that went down on Aug. 27, despite being billed to be performing and being up for numerous awards. According to reports, the Canadian crooner missed the show because he was fatigued from his hectic touring schedule. Fans also missed a chance to see the singer at a private party he was supposed to perform at in Los Angeles the day before the awards. The shindig was put on by Grey Goose for their 20th anniversary, but it got shut down before it even started. Grey Goose later sent out an e-mail addressing the closing of the event. “Due to unforeseen production issues, tonight’s event has been canceled. That said, Grey Goose and The Weeknd will be back together soon – bigger and better!” it read. Listen to The Weeknd's cover of R. Kelly's "Down Low" below.